One of the most common applications for differential pressure transmitters is flow measurement. 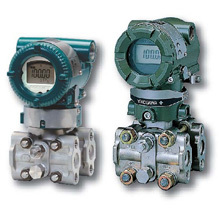 A differential pressure transmitter can be placed across many types of primary flow elements like orifice plates, pitot or venturi tubes to measure flow. Primary flow elements create a pressure drop (square root proportional to flow). Flow proportional output signals from a differential pressure transmitter are possible through integral square root extraction. The square root function of differential pressure has extremely high gain at low flow rates leading to large output changes representing low changes in flow rate at the bottom end of the measurement range. Output signals can become erratic at low flow rates due to high gain. Host control systems can experience difficulty controlling flow rate based on a highly fluctuating input signal from the square root extracted differential pressure. DPharp differential pressure transmitters have some unique signal conditioning features to eliminate instability at low flow rates. Flow rates above 20% of maximum flow produce a large square root extracted differential pressure signal for a given change in flow rate. Flow rates around 5% of maximum flow produce a small square root extracted differential pressure signal for a given change in flow rate (See Fig.1). High gain in the low flow rate operating area amplifies any inherent noise or changes in flow rate leading to pressure transmitter output instability. DPharp has a software capability to stabilize output signals at the low end of a flow measurement range minimizing erratic output signals. An integral low cut mode features a user programmable transmitter output and set point to change the output to a linearto- pressure (Linear) or zero (Zero) status. The flow rate set point at which an output transition occurs is programmable from 0 to 20% of full scale flow. Fig.2 shows Linear and Zero output modes set at 5 % low cut mode. Hysteresis is incorporated into the low cut mode such that when the actual flow rate is equal to the low cut set point that output oscillation will not occur. Hysteresis is fixed at a nominal 1% of full scale flow. Fig.3 details how the hysteresis affects the pressure transmitter output.